Pure Evoke F3 review | What Hi-Fi? Adaptability, more so than strength or intelligence, is the key to survival. So Charles Darwin is unlikely to have been considering hi-fi while composing his Theory of Evolution, but similar rules apply. There are few so blatant examples as radio. 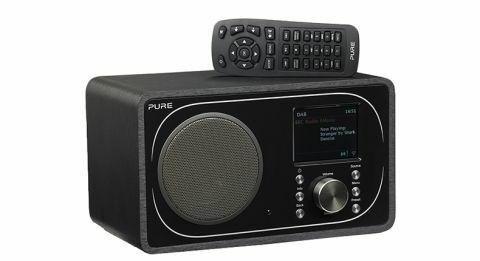 Take the Evoke F3: where in the not so distant past basic radio would have sufficed (as long as it sounded good), Pure is now also offering DAB and internet channels, Bluetooth, aux-in and Spotify Connect. This is how radio is surviving and, more to the point, keeping itself fresh. The Evoke F3 does still look very much like a traditional radio; the left half is dominated by a 3.5-inch full-range driver while on the right there is a dial for volume and tuning flanked by two sets of three buttons for menus, source selection etc. The only major giveaway as to its modernity is its full-colour screen – about the size you’d find on a portable music player. In essence, it’s an attractive piece of kit that feels well built. The full-colour display, for example, is an upgrade on the scrolling strip of Pure’s cheaper but Award-winning Evoke D2. Our only complaint in spec terms would be the remote control, which is a tad lightweight and plasticky – but there is always the Pure Select app, which is free for Android and iOS users. Using the F3, as you’d likely expect from a radio expert such as Pure, is a breeze. Autotune works as well as it could, and there’s space to preset 20 of your favourite channels – 10 each for FM and DAB radio. The only other manual labour you really need do is enter the password to your wi-fi network to access internet radio and Spotify Connect. Digging in with Steve Lamacq’s late afternoon show for BBC Radio 6 Music, the first thing we notice is a full-bodied midrange. It carries from his spoken word into the music, where vocal and melody is brought to the fore, dominating the mix without becoming intrusive or particularly unbalanced. On a more stripped-back track, such as Beans On Toast’s I’m Home When You Hold Me, the Evoke F3 doesn’t overextend itself with analysis but focuses on a warm and full-bodied vocal, while still offering a decent amount detail in the acoustic guitar accompaniment. As Lamacq changes direction with Digable Planets’ Rebirth Of Slick (Cool Like Dat), we are equally impressed by the Evoke F3’s sense of the track’s laid-back hip-hop beat. While it isn’t the most dynamic of performances – this is a £130 radio with one modestly sized drive unit – it is rhythmically expressive enough to convey well the temper of the music. That sound is uniform across the unit’s potential sources – Bluetooth and Spotify Connect are major draws, meaning the Evoke F3 doubles up as a wireless speaker – and results in a rather engaging listen. Our main issue is with how closed-in that sound is. While fine for a worktop radio (the full-bodied midrange and decent sense of timing is excellent by those standards), we struggle to see ourselves making full use of the Evoke F3’s other facilities, rather than spending money on a purpose-built and better-equipped wireless speaker. We want more space, separation and insight with less rolling-off either side of that midrange. We compare it to the Award-winning Roberts Stream 93i – which admittedly has more drivers, but is now widely available for the same price as the Evoke F3 – and recognise that clear difference. The Stream 93i’s greater soundstage not only permits a less claustrophobic sound, but helps feed in those subtleties and expression that elevate music and talk radio. The Roberts also offers connections for USB and Ethernet, which the Pure does not. But it isn’t so forthcoming with the midrange, and lacks some of this Evoke’s warmth in that respect. Pure’s focused and full-bodied sound will undoubtedly win over many listeners and, considering this is principally for listening to radio, sound has understandably been Pure’s focus. So, if you want a neat, smooth unit with plenty of features, this is unquestionably one to consider.